A hotly anticipated game was in store for everyone who attended this thrilling derby match. Antonine where looking for revenge after a 4-0 beating just three days earlier from the same side they would face today. Antonine seemed determined to deny Drumchapel the double after their win midweek gave them the upper hand in the league and the game started with a flurry of half chances. The best of the early chances fell to Antonine after Daniel Hamilton's free kick was magnificantly saved by goalkeeper Jack Hamilton. Eventually the early pressure paid off as Owen Gallacher's cleaver ball in behind was impeccably finished by Adam Boyle for his 30th of the season and possibly one of his best goals. Drumchapel's best chance to equalise was denied brilliantly by Andy Carroll who produced an excellent double save from Calvin Bland's effort, who then put his rebound over the bar. Soon after the restart Kieran Dougan forced an error in the Antonine defence and fired home to level the score in this inthralling derby match. The game fell into a lul and you could feel the Drumchapel side growing into the game, building their confidence. However, they were behind after Antonine won a free kick just over the half way line. Mark Sweeney took it and Owen Gallacher met the ball with his head to regain the lead. Drumchapel looked to get back into the game and Mathew Graham had an excellent effort denied by 'keeper Carroll after Graham forced an error. They then had Kyle McKellar's effort hit the bar. Antonine had a chance to rap it all up, but Dominic Cairney could only blast wide after good play in the middle of the park. Drumchapel had one final chance from a free kick and with just one minute remaining of normal time it was now or never for the boys from Drumchapel. The free kick though was well caught by goalkeeper Andy Carroll and after some added time, the game was over and Antonine had some silver ware to show for their successful season. Drumchapel can count themselves unlucky and now will want to concentrate on picking up the league title. Andy Carroll - made vital saves at vital times to make sure Antonine came away with the silverware. Kieran Dougan - his goal was vital in the game he could have had more but Andy Carroll stopped him from scoring more than just the one. Adam Boyle's magnificent goal. 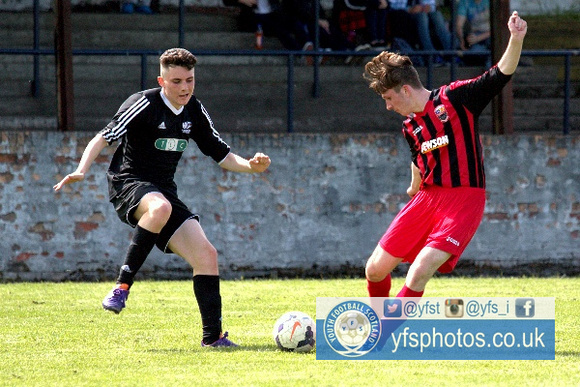 A wonderfully taken half volley and created well by Owen Gallacher and the two strikers seem to work well together. The effort from Calvin Bland that produced the double save from keeper Carroll to make sure the scoreline stayed at 1-0 for the time.